Council Candidate Receives Endorsement, or Does She? 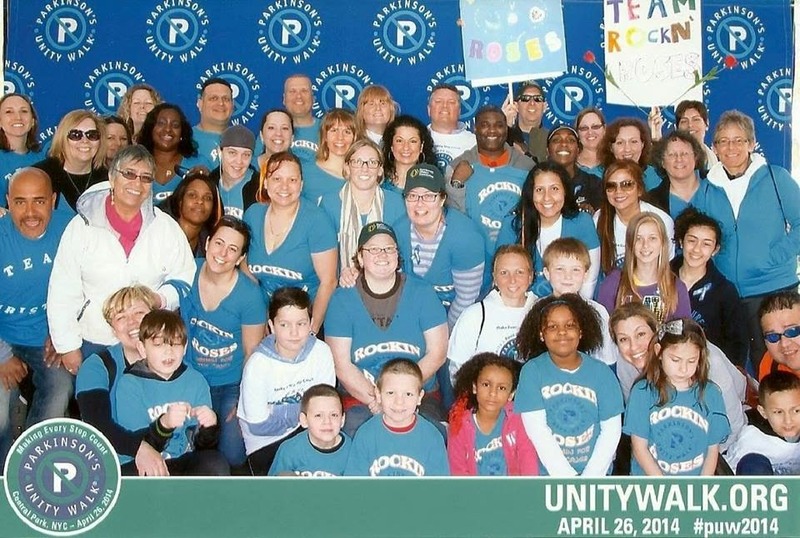 Deborah Keeling-Geddis is featured in an article published on Bergen Dispatch for having received the endorsement of the Hackensack Education Association. In the article, a quote is presented from HEA President Chris Ryan. Ryan says, "The HEA is proud of Deborah Keeling Geddis' commitment to our community both in school and now with her candidacy to serve the entire Hackensack population. Few step up to such challenges, and we are happy to see one of our own offer herself as willing to take on the challenge of elected public office. We commend Debbie and wish her all the luck in her campaign." The quote reads more like a non-committal kind word than an endorsement. Of the "endorsement," Chris Ryan, the HEA President said: "The HEA has a policy of not endorsing candidates for city office. Since Debbie is one of our members, we offered the statement applauding her efforts, expressing our pride that a member would want to be involved in serving the city, and encouraging any of our other members to serve if they hear the call. But that pride and that praise should not be considered an endorsement. However, we continue to be happy for Debbie, and we continue to applaud her efforts, as we do many others who are running for city office. 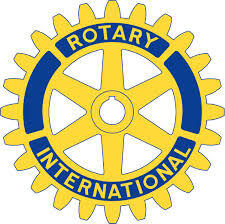 It is true that that I made that statement for her, and I have made positive comments about Jason Nunnamaker as well. And I'm sure if I knew the other candidates well I would be complementing them too. 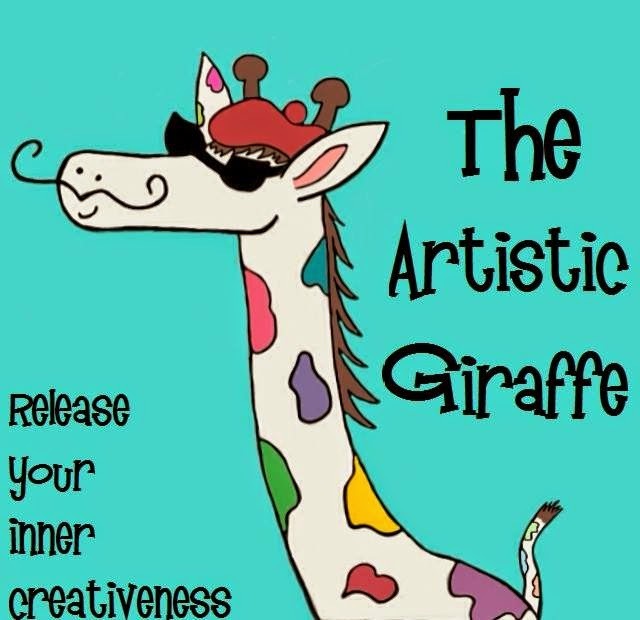 But praise, while sometimes noteworthy, is not an endorsement." A request for comment from Keeling-Geddis also went un answered. A link to the article has been removed from Keeling-Geddis' Facebook page and replaced with "I'm proud to have the support of my union, the Hackensack Education Association, behind me." I am still not seeing the statement of support, but maybe Keeling-Geddis does. Well I commend all four candidates for getting involved in the political process and I wish them all the best of luck on Tuesday. Did I just endorse everyone? This wouldn't be the first time that Keeling-Geddis misunderstood or misrepresented facts. Remember when she went to Trenton to try to stop the Finance Board from approving a bond ordinance and misrepresented facts about the police contract negotiations? While the article that I believe misrepresents the HEA's statement has been removed from Keeling-Geddis' Facebook page, a poster "Sachem Oratam" has taken to Keeling-Geddis' page with their comments. 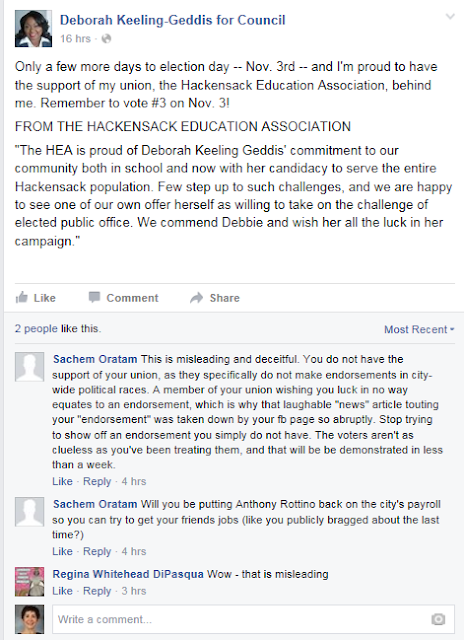 Sachem Oratam contends that the HEA does not issue endorsements and chastises Keeling-Geddis for misrepresenting the HEA's statement. Sachem Oratam goes on to criticize Keeling-Geddis' affiliation with ousted members of the administration and questions her motives for running for office which Sachem feels are to further her agenda of politics, favors, and patronage jobs. Needless to say these comments were removed from Facebook, but Hackensack Scoop has provided them below. For more on Keeling-Geddis' past attempts at patronage jobs and how this bid is nothing more than a sour grapes attempt to regain a seat at the round table after being turned away by the Citizens for Change, click here. 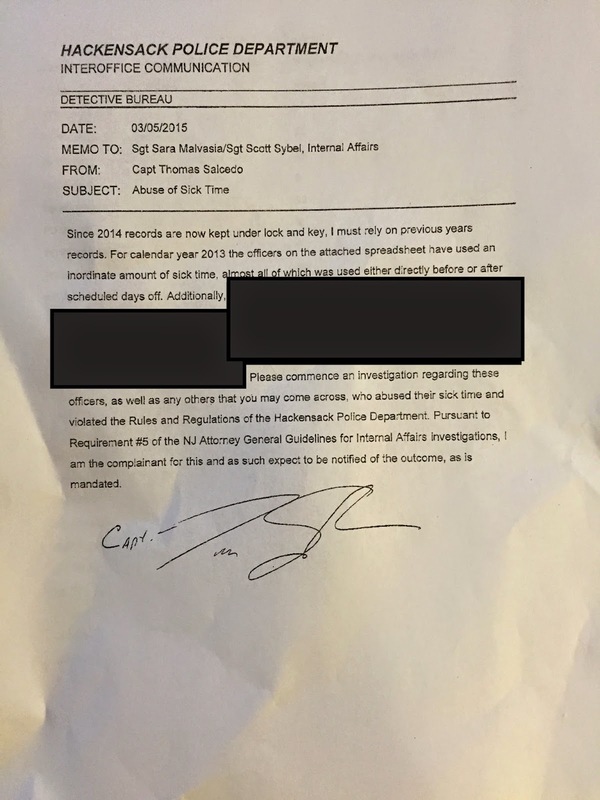 A Hackensack resident who has requested to remain anonymous has filed a confidential request for an investigation with the New Jersey Election Law Enforcement Commission (NJ ELEC). 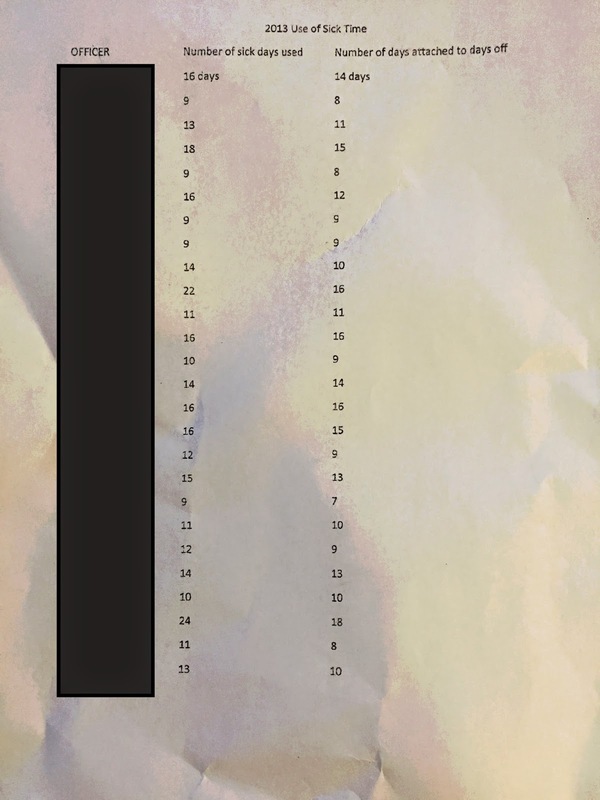 Jason Some, a candidate for the Hackensack City Council, has published campaign literature that according to the confidential report filed with the Commission violates NJSA 19:44A-22.3 which requires that all campaign literature clearly identifies the person or committe financing the campaign materials and literature. While the offense carries a penalty of up to $6,000, a review of NJ ELEC final decisions shows that similar infractions have carried fines of a few hundred dollars. Of the omission, Some states it was an "error" in the printing process. Some contends that proofs of the material had the disclosure but the printed material did not. It seems like a pass the buck excuse, so I can't help but say that Some's literature also lacks a Union Bug. This is notable as Some is backed by the Citizens for Change (current administration) who have appointed Anthony Rottino and David Troast to the position of City Manager. Both Rottino and Troast have taken a hard line stance in negotiating with our Collective Bargaining Units. Perhaps Some, the Citizens for Change, and Troast will all take this campaign literature snafu as a lesson in the benefits of supporting union labor. At a recent debate Some was critiqued for calling the Anderson Street area "blighted." Some fired back stating that he never referred to the area as "blighted." The piece of literature, which Some has admitted to Hackensack Scoop lacks the required disclosures, calls for aggressive "development to other blighted areas in the City such as Anderson and Hudson streets." Despite being superficially offended by being "accused" of calling areas of Hackensack blighted, in an email Some says "I did in fact use that term" and went on that "it is a common term used when discussing redevelopment." This evening, a debate was hosted at Temple Beth El for the four candidates for a one unexpired term on the City Council. 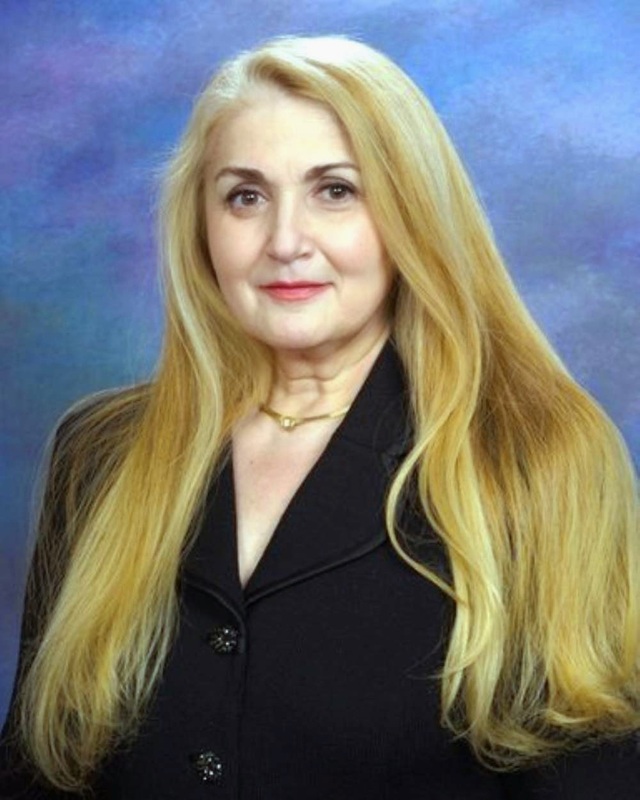 The council seat was made available by Rose Greenman's resignation. Candidate Jason Some was appointed to that seat in April of this year. The candidates had the opportunity to share their platform and discuss issues facing the City of Hackensack. 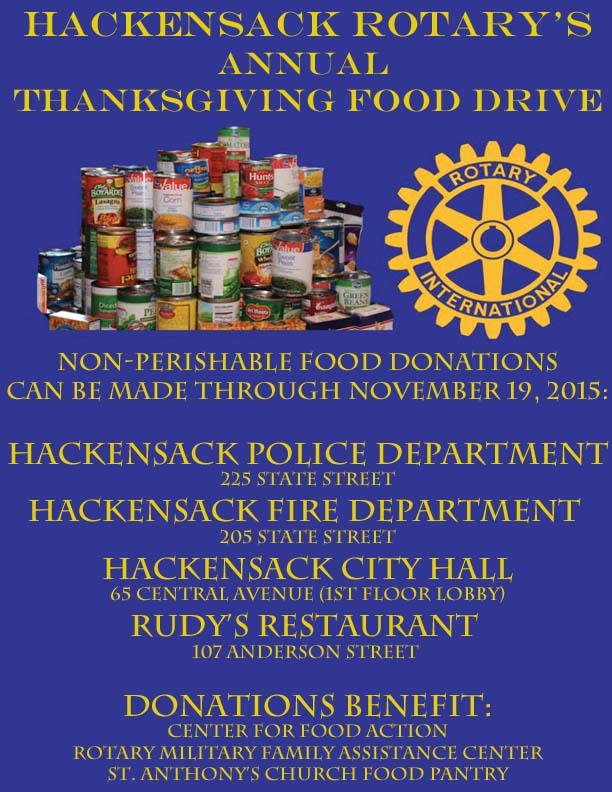 Richard Cerbo, a life-long resident of the City of Hackensack and non-profit fundraiser. Debra Keeling-Geddis, a paraprofessional in the Hackensack Public Schools. Debra Keeling-Geddis declined the invitation to the event electing not to attend and share her platform or position with voters. 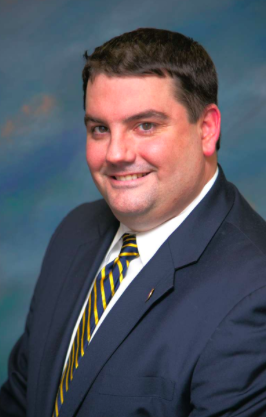 Jason Nunnermacker, a life-long resident of Hackensack, an attorney, and current President of the Board of Education. Jason Some, a life-long resident of the City of Hackensack, sales director of the local Some's Uniforms, and current appointed member of the City Council. Candidates were presented questions from the audience through the moderator, Larry Eisen. The topics discussed ranged from the candidates' qualifications, redevelopment, the controversial settlement agreement with the Hackensack University Medical Center, and relations between the City Council and Board of Education. Richard Cerbo admits that he has no qualification to review, analyze, or approve a budget in excess of $100,000,000. He believes that it would be his place to entrust qualified professionals to advise the Council and explain the budgeting needs of the City to him. Jason Some relies on his experience in small business and agreed that qualified professionals are needed. Jason Nunnermacker is the only candidate who has experience managing a comparable budget as a member of the Board of Education. Nunnermacker prides himself on the Board's ability to consistently pass budgets that were zero-based and within the State-mandated caps, unlike the current council. Richard Cerbo took the position that the City should take a firmer stance with the Collective Bargaining Units and negotiate harder. Given the give backs and concessions on health insurance and modest 1.5% annual raises under the current police contract, and modest raises in the fire department contract, and the controversy around the police negotiations, this may be a difficult pill for many to swallow--and frankly an unrealistic position. Jason Nunnermacker was the only candidate with experience in Collective Bargaining Agreements and negotiations having sat on the Board of Education. Nunnermacker and the Board of Education negotiates with four separate Collective Bargaining Units and handles employment issues with each of those unions every day. Richard Cerbo sees tax abatements for redevelopment projects as the biggest issue plaguing the City. Cerbo sees the value of tax abatements to attract developers to revitalize Main Street and surrounding areas, but believes that the lavish twenty and thirty year tax abatements being handed out are shifting the burden of future tax increases to home owners. Jason Some sees tax abatements as absolutely necessary to attract developers and says that every hammer banging on a project on Main Street is a dollar sign of tax revenues. Jason Nunnermacker is a supporter of the redevelopment efforts. Nunnermacker believes that the redevelopment should be expanded to areas like Anderson Street which is anchored by the NJ Transit train station. Nunnermacker, however, is the only candidate who understands and articulates the long term effect on the City, and schools, of the tax abatements being offered to developers today. As the City continues to attract development we create residents, children, and a greater demand for city services and seats in our overcrowded schools. Where Nunnermacker faults the current council is with their lack of consideration of the mid and long term needs of the City that are created by development projects when granting extended tax abatements. A resident posed a question regarding the proposed plan of a senior care facility on Prospect Avenue to neutralize medical waste on site. 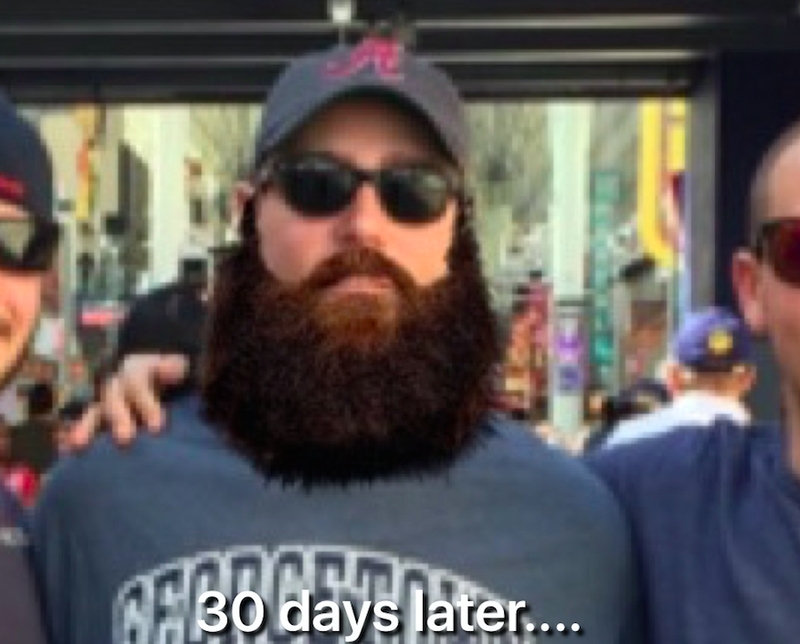 Cerbo was unaware of the plan while Nunnermacker opposed the plan. Some was well aware of the plan and cited his communication with the Freeholder John Felice to support the opposition of the facility and protect residents' interests. Richard Cerbo wants to increase the use of crisis and help hotlines to address drug abuse and help those in need. Jason Some cites his families mentoring and tutoring program helping the homeless to find and maintain employment as his commitment to the disadvantaged. Some encouraged soliciting corporate support of the recreation programs to fund additional youth activities to keep the youth off the street. Some also encouraged more police presence in youth programs to create a culture of trust and support between the police and children of the community. Nunnermacker cited his charitable work and commitment to doing what he can for those in need while seeking to work with the County to enhance programs that are available. This year, the City Council entered into a controversial settlement agreement with the Hackensack University Medical Center where the City surrendered long term revenues, the cost of ambulance services were passed on to residents, and several tax appeals were settled in favor of the hospital, in exchange for a short term cash infusion into the City. Emails made public reportedly show that the Council had not reviewed and understood critical parts of the agreement and when asked at a public meeting nobody on the council could identify the legal counsel who drafted or negotiated the multimillion dollar contract. Some declined to comment on the process but supports cash payments to the City. Cerbo read about the agreement but did not know enough to comment on whether the deal was good for the City. Nunnermacker has been a vocal opponent of the deal and believes that the City residents were sold short by a Council who was stampeded by the hospital. Redevelopment projects undoubtedly put strain on our services and already over crowded schools. The Board of Education has already entered into a $1,000,000 per year contract to rent the Padre Pio School due to overcrowding in the Hackensack Public Schools. Tax abatements and redevelopment projects need input and consideration of not only the City but also the Board of Education. Cerbo and Some both supported increased communication, while Nunnermacker demonstrated experience working with the City Council as a Board of Education member to bring about change and progress for the residents of the City. Nunnermacker cited his work with Mayor John LaBrosse to bring recreational swim at the high school to residents, have city grounds used as playgrounds for special needs students, and bringing a youth police academy to Nellie K. Parker school. The Hackensack Elks have done extensive work in supporting both our active duty servicemen and women and our veterans. See: Elks Adopt Fort Drum Platoon, Elks and Rotary Team Up to Feed Veteran Families, and Elks Support Veterans (NorthJersey.com). The Elks have shared a great partnership with the Adopt a Soldier Platoon (AASP). AASP is a local non-profit organization committed to supporting and improving the morale of our active duty servicemen and women around the globe. On September 19, the Elks will be hosting a beefsteak fundraiser with all proceeds to benefit the Adopt a Soldier Platoon and their projects in support of our veterans. 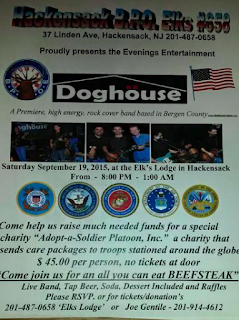 In addition to the beefsteak dinner, your $45 ticket includes tap beer, soda, dessert, and a live band "The Doghouse." For tickets, please call the Lodge at 201-487-0658 or Joe Gentile at 201-914-4612! Ever have a craving for good Mexican food? 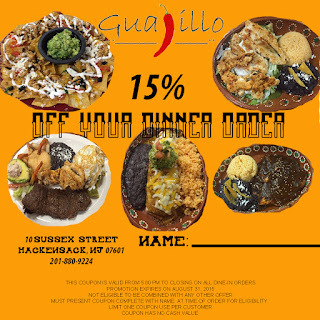 Go beyond a plate of nachos or bowl of guacamole and enjoy true authentic, and delicious, Mexican fare at Guajillo Restaurant at 10 Sussex Street in Hackensack! With generous serving sizes, and the most reasonable of prices, you can enjoy quite the feast! 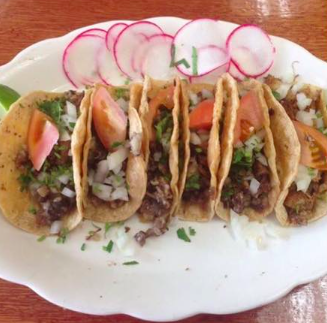 Check out what we shared on our first visit, all for under $50! We started out with Al Pastor (seasoned pork) and Fish tacos and an order of homemade Salsa, Guacamole, and chips. Delicious and fresh are the only words to describe what was delivered to our table. We went on to enjoy the "Fajitas Mix" which was a "sampler" and the Pollo Mole. The Pollo Mole was a chicken cooked in Guajillo's signature "mole" sauce which is a combination of cloves, sesame, nutmeg. The "Fajita Mix" included steak, chicken, shrimp, rice and beans, and a fried egg served over chips and salsa verde. We finished with an order of bread pudding which was prepared at the time of ordering, served hot, and complete with a sweet syrup and candied pecans. I generally don't like sweets, but I will order this time and time again! We have been back twice since and the food has consistently been fresh and delicious. 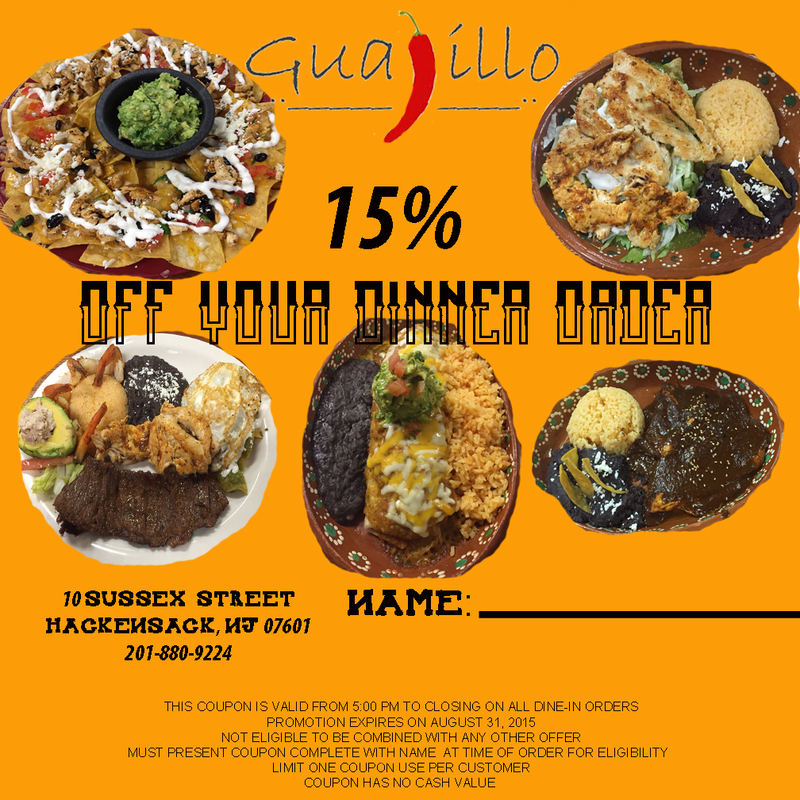 Exclusive through HACKENSACK SCOOP, enjoy this 15% off coupon on your first visit for dinner to Guajillo Mexican Restaurant! Just print this coupon, put your name on it, and present it at the time of order! In 2008, the City Council, under advice of special counsel Richard Salkin, Esq., entered into an agreement with the Hackensack University Medical Center regarding the development of certain properties owned by the hospital. Under the agreement, HUMC paid $400,000 per year in rent, scheduled to rise to nearly $1,000,000 per year for a 50-year air right for a walk way constructed over Atlantic Street. According to Richard Salkin, who largely crafted the agreement, the formula for the annual rent was negotiated by HUMC and tied to the City’s tax rate, which has increased since 2008. HUMC has seen larger than expected increases to their annual rent for these air rights, and came back to the city to renegotiate. Using several tax appeals as leverage, HUMC (according to Salkin) “bullied” and “stampeded” the Council into renegotiating the deal out of fear. Under the new agreement with HUMC, the hospital will pay the City $4.5 million, they will drop their $3 million in tax appeals, their annual air space rent will be reduced to $200,000 for the remainder of the lease (with no annual increases), and the City will stop being billed for ambulance services (more on that below). A key, and very controversial, aspect of the 2008 agreement included the disbanding of Hackensack’s paid-EMS services. Under the 2008 agreement, HUMC provides ambulance services to the City of Hackensack and bills the City for any fees above and beyond $140,000 (done at gratis) for service billings not collected from patients’ insurance companies. In the past 8 years, this billings averaged between $15,000 and $20,000 per year. Under the new agreement, the City will not be billed for any services, instead all residents will be billed directly. This represents an additional at least $160,000 in billings for the hospital on the backs of tax payers, all so that the City can save about $20,000 per year. Despite the agreement being signed, and a resolution adopting it having been passed, the City Manager David Troast (presumably in a lame attempt at defending this terrible BLUNDER) has continued to assert the billing for services is still under negotiation. Outraged residents countered the Council’s assertion the ambulance services were not openly discussed by pointing to emails circulated in November where HUMC clearly wrote of the ambulance service billing being done direct to residents. Today, Richard Salkin filed a complaint in lieu of prerogative writ seeking to have the new agreement thrown out by a judge. Salkin asserts that there are conflicts of interest abound, and charges Mayor Labrosse with a history of flagrant disregard for ethics laws in his serving as Mayor of Hackensack. 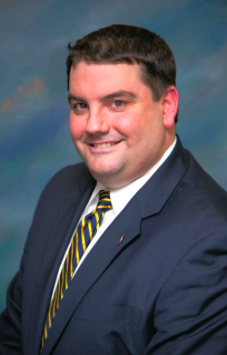 Labrosse, who works for HUMC (and was promoted from a Janitorial position to a white collar title “Safety Inspector” after obtaining the seat of Mayor), and whose wife is a Board of Education employee, has voted on at least two occasions on matters before the Council pertaining to the hospital and voted to approve an $800,000 settlement agreement with the Board of Education last year. Salkin contends that Labrosse continues to disregard his ethical obligations in this deal with HUMC. Labrosse was present for closed door negotiation discussions pertaining to the renegotiated deal, and according to the suit was “kept in the loop” on email exchanges post-deal as the Council scrambled to craft talking points around the deal when questioned on the blunders and give-aways to the hospital. According to Salkin, this renegotiated deal is a $16,000,000 windfall for the medical center. Salkin is seeking to have the renegotiated deal overturned by a judge for two reasons. First, Mayor Labrosse’s involvement in confidential negotiation discussions, despite his employment with HUMC. Second, the technicality that the council has sought to revise an ordinance passed in 2009 (the 2008 agreement) through a resolution, which he asserts is not proper under the law. Salkin contends that this deal was so hastily negotiated and settled that the city attorney (who has no problem billing the City) only spent 24 minutes reviewing the contract. When asked by Editor-in-Chief Steve Gelber of HACKENSACK SCOOP, no member of the council, City Attorney Tom Scrivo, and Chief Financial Officer Jim Mangin could not identify who represented the City’s interests as an attorney in the negotiation of this deal. They pointed the finger at City Tax Assessor Art Karlsson. When asked if any more than 24 minutes to review the final contract billed by Tom Scrivo was expended by attorneys assisting the City in negotiating this mammoth contract, there was absolute silence. When Gelber elaborated asking if the City relied solely on our Tax Assessor to review legally binding documents and contracts, the silence continued. Former Councilwoman Rose Greenman has filed a civil suit in the United States District Court for the District of New Jersey. Greeman is suing the City of Hackensack, Mayor John Labrosse, Deputy Mayor Kathleen Canestrino, Richard Salkin, Art Koster, and Al Borelli in their individual and professional capacities. In her complaint, Greenman alleges that she was discriminated against based upon her national origin, ethnicity, and Jewish faith, which led to her resignation from the council last month. Despite Labrosse having led the ticket for the slate of candidates that swept into office in May of 2013, Greenman alleges that shortly after the election Labrosse told Greenman that he was “going to make [Plaintiff’s] life a living hell,” because she was “not a real Hackensackian, not a real American.” The claim is actually comical considering that Labrosse ran on the same slate as Greenman, in fact he led the ticket, just a few short months before the alleged comments were made. Greenman goes on to state that Labrosse refused to allow a rabbi to be present at the swearing in ceremony because a rabbi would make the event “boring.” Greenman alleges that Labrosse has a dislike for members of the Jewish faith because he owned a fish market in Teaneck that failed as it was not kosher certified and the large Jewish population of Teaneck would therefore not shop at his establishment. Greenman accuses Canestrino and Labrosse of blocking Councilman David Sims (the second highest vote getter) from being Deputy Mayor due largely to his color. Greenman states that the pair repeatedly referred to Sims as “dumb” and “stupid” and stated they would rather have constituents (which she alleges they called “Niggers”) riot than name Sims the Deputy Mayor. In August of 2014 the City Council passed a resolution ending the payment of health insurance benefits for council members and part-time workers. Greenman alleges that this was a retaliatory act for her attendance and vocal opposition of a bond ordinance (and bashing of the PBA) at a Department of Consumer Affairs hearing in Trenton. Greenman alleges that this was done to target her as she was the only member of the council affected by the decision as all other members of the council received tax payer funded insurance through their own employment, or their spouses’ employment at the city or board of education. 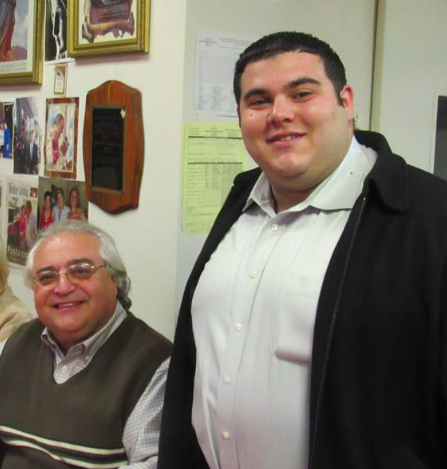 Greenman goes on to accuse Al Borelli of intimidation and improper use of city zoning laws to harass and intimidate her regarding her allegedly improper use of her apartment as a registered place of business. A violation cited by residents Richard Salkin and Jason Nunnermacker. Requests for comment from Labrosse and Canestrino were unanswered.